These paintings, like most of the works in the show, are oil on linen, a material into which the colour soaks and bleeds, rather than resting on top of it. This softens the lines, and often mutes the tones, all of which are unlikely, if not downright unreal. 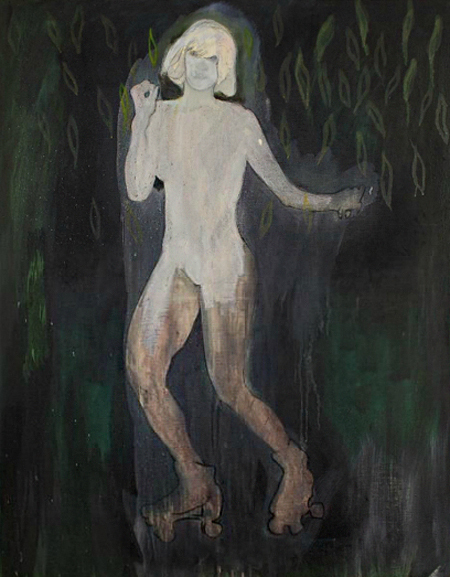 Both are divided into three horizontal areas of colour, with the central one split by the floating walking figure who provides another opportunity for the placement of colour on either side, so that the paintings become, fundamentally, about the interplay of colours, as well as the relationships between the figure and the space, and the viewer and the painting. This structural division into different colour bands is also referenced and played out more explicitly in Painting for Wall Painters (Prosperity P. o. S.) (2008 – 2010) an image of a wall painted with flags, in the capital city of Trinidad (where Doig is now permanently based). Here, the uniformity of the flags’ colours and the repetition of the limited palette is undermined by the use of distemper on linen, which makes distinct each individual, broad brushstroke and transforms the original wall painting into a painting about painting. The wall, the colours, the flags, the world itself, all become less tangible. 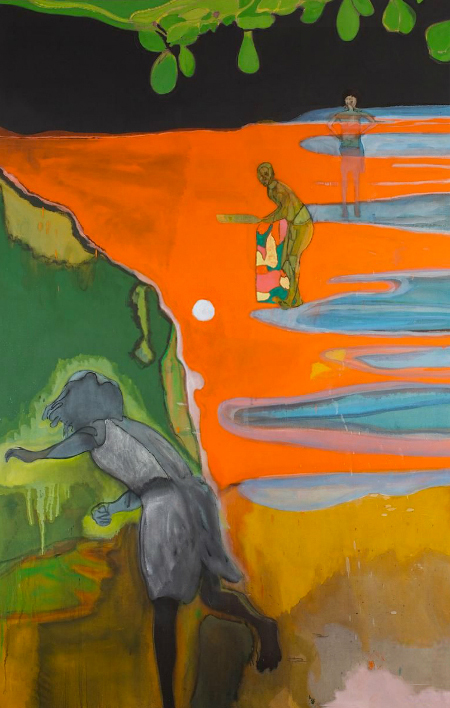 Similarly, in Cricket Painting (Paragrand) (2006-12)oil paint is laid on the canvas in acid hues of orange, green and blue, the surface flecked in places with splashes of paint, so that action of the image – a girl lobbing a cricket ball that hangs in the centre of the canvas like a white, full moon towards a boy waiting at a wicket – becomes secondary; a compliment to the dynamism and energy of the colours’ relationship. 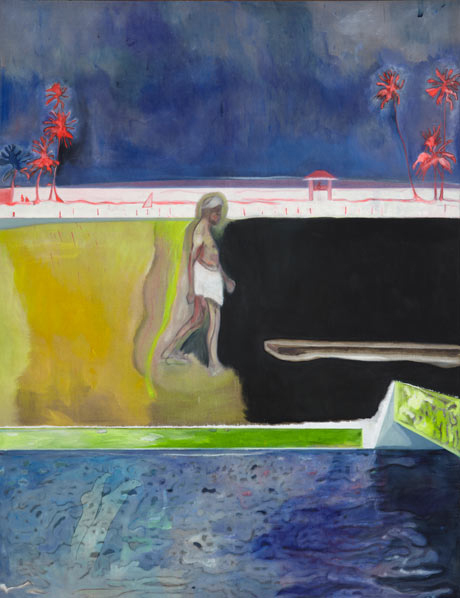 Many of the dates of Doig’s paintings indicate how long it takes for him to produce them and so, despite their vibrancy and energy, they are considered works containing a powerful quietness that goes beyond the purely decorative. Any amount of time looking, contemplating, and interacting with Doig’s work is well worth it.